New to the Forum, NOT new to old celicas! Hey all, figure it's time I post in here... at the moment I've got a '77 RA29 that I'm starting to restore, but my history with old celicas goes back a LOT farther than that! In 1997 when I was 16 I got my first car, an '82 Celica GT-S. I joined up with celicas.org on the old OCC mailing list long before online forums were around. Learned a lot from guys like Matti Kalalahti, Sean Figgins, Gary Meisner, etc. 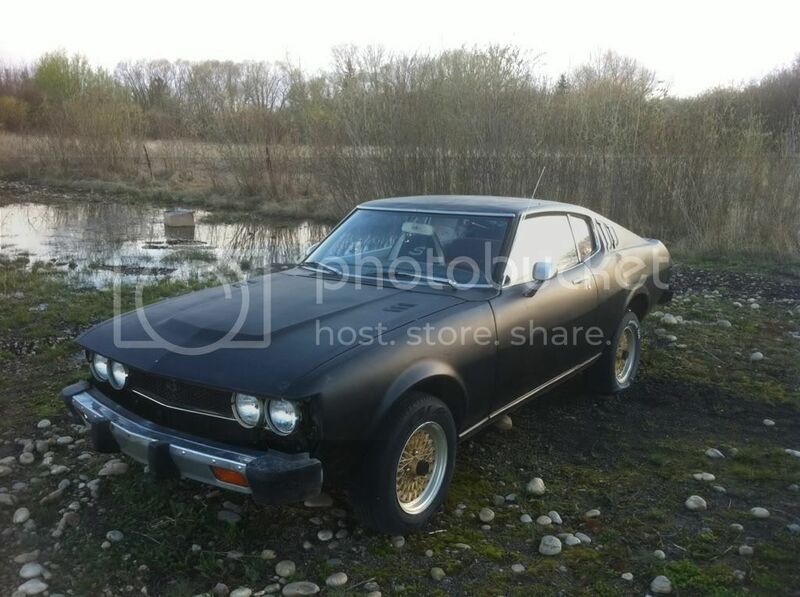 So I found myself an old '77 Celica in central Alberta last weekend, picked it up on a trailer (wouldn't start) and get the thing back down to Calgary. Haven't had much time to work on it this week, as I'm getting everything buttoned up on the MR2 to be picked up tonight, but I did find that it was just a loose wire on the starter. She starts right up and purrs like a kitten! It has weber sidedraft carbs and a header already, but the body is rough and the interior trashed. I plan on leaving the 20R in there, or possibly doing a 20/22R hybrid. (a 1UZ is a VERY remote possibility). I want to do a complete resto on the body, and take the interior to a local shop to have it recovered/repaired, etc. I've already ordered complete new brakes (drums, rotors, shoes, pads, calipers, wheel cylinders, master cyl) and both clutch cylinders. The existing stuff feels spongy and has likely had the same fluid in it for years. Considering I'm planning on the occasional autocross, I want everything to be in good order. Anyway, I'll start a new thread for the build/resto itself, but just wanted to say hi! Re: New to the Forum, NOT new to old celicas! I hope your "Moose" 29 has s_m_i_l_e_y bumper bars & not USDM "park bench" ones ! Smiley's seem bloody expensive here, so I'm thinking about going with fibreglass smileys. Even where Celicas roam free here in everyones back yards, VGC bars are pretty much non existent now. We'll also have to resort to the fiberglass ones soon ! that 77 body seems to be in fairly decent condition from the pic. are there major rust spots? i like the wheels also. taman86 wrote: that 77 body seems to be in fairly decent condition from the pic. are there major rust spots? i like the wheels also. Thanks man, there is a dent in the rear quarter that looks like it was hit with a baseball bat, the lower part of the rear hatch is rusted badly, and the rear part of each rocker panel is rotten. Other than that it's not bad. Which brings me to another question I'm wrestling with tonight. Do I go balls to the wall, strip the entire car down to just body, sandblast and repaint the entire thing? Or do I perform a more surgical operation, leaving the engine and the rest of the drivetrain in place (stripping the interior and body panels of course) and just remove the cancer, weld in new metal and repaint? I'd be doing 90% of the work myself so cost would be similar with both options, it's just the full on restoration would be a LOT of work. On the other hand it wouldn't be that hard to strip a celica! I'm used to working on the MR2 where there were three heat exhangers (rad, I/C core, I/C heat exchanger), multiple pumps, etc. etc. etc. well for me not having a garage or shop, just fixing the problems and doing just whats necessary to get it fixed. if you have the means and time to do a full teardown, an enclosed area ti sandblast and paint then ide say go for it. i say that it is A LOT of work and things can break and be lost in this process where as if you are only repairing the skin then you dont really have to tear into it too bad. i think it comes down to time, experience, and resources available. there are a lot of people that think they can do this over a certain period of time, gain experience as they go, and dive in with a hope and prayer it all goes well to fit within a tight budget. 6 months later its barely torn down and they realize itll take another year or more to be put back together. Yeah that's exactly what I'm thinking... I've done some pretty heavy work on cars, but it's all the little details that would make a full restoration take forever. I've been reading a blog about a guy that's been doing one for the last 3 years. I bought this car to drive it, not work on it, so I'm leaning towards a patch job as far as the rust goes, and then a full sand and repaint the exterior. Just bought a MIG welder tonight and haven't used one in about 12 years, turns out I'm not as bad as I thought I'd be! Had to weld a new flange on the header as the old one had cracked and was leaking badly. The GF wants me to finish up for the night now otherwise I'd keep going! I want to get her on the road in the next could weeks, then take her to some auto-x races and have some fun, then I'll spend weekends fixing the rust, and one long weekend mid summer I'll strip and paint her! At least that way I can get away with just buying new exterior rubber and leaving the rest of the car in place. The GF wants me to finish up for the night now otherwise I'd keep going! then I'll spend weekends fixing the rust, and one long weekend mid summer I'll strip and paint her! ummm... You need to phrase things better there - I blew cola out my nose reading that ! toyboyracer wrote: ummm... You need to phrase things better there - I blew cola out my nose reading that ! WOW! I think I was a little woozy last night when I wrote that! Thanks guys! Had good luck with the el-cheapo Princess Auto welder. Basically recreated a flange on the header from scratch. Started her up and she sounds tons better! Let it idle for a while and there was a minor coolant drip. I found the hose to the overflow bottle was blocked, and one of the seals in the rad cap was cracked. Cleaned out the hose to the overflow and ran a little stop leak in the rad (I know I know) and no more drip so it was a successful day! FYI - Since the last post I've done a fair bit (no pics to post at this point). I've stripped the interior expect for the dash, removed all the sound deadening material, and am ready to sandblast all the rust on the inside and start welding new metal in. I also picked up a MKI Supra rear axle to throw in there in prep for an eventual engine swap!! !